Do you read magazines on your e-reader? Do you read newspapers on your e-reader? Production of paper books, magazines, and newspapers is responsible for a large part of the world's carbon dioxide emissions. Since 2009, the industry has slowly been transitioning to what's considered a more eco-friendly option - electronic readers. According to the Author Earnings 2017 report, e-books account for 55% of all online book purchases in the US. How much of my CO₂ emission can I prevent by switching to an e-reader? The production of an e-reader, for example of a Kindle, comes at a certain price. According to the Cleantech report, all such devices cause costs associated with mining, energy use, transport, and disposal of e-waste. 55 kg CO₂ for a smartphone (iPhone or similar). These numbers don't take into consideration other environmental consequences, such as the exploitation of the world's fossil resources. Two good examples are lithium, necessary for the production of the battery, or columbite-tantalite, the mining of which helped to fund military conflicts in the Democratic Republic of Congo. Naturally, the electronic readers don't only cause CO₂ emissions in the production phase - after all, you need to charge their batteries regularly. Nevertheless, the emissions associated with charging don't exceed 2% of the energy used during production, which makes them statistically insignificant. 0.62 kg CO₂ for a newspaper. These values are average across the industry - for example, the production of a bulky textbook might release even 10.20 kg of carbon dioxide into the air. Still, it's a reasonable estimate for our calculations. In order to calculate how much of your CO₂ emission can you prevent, we need two pieces of information: what electronic device you use, and your reading habits. E-reader type. As described in the previous section, the kind of an e-reader you use has a massive influence on the carbon footprint. Additionally, we need to know how soon will you replace it. The average lifetime of a Kindle reader is four years, but for an iPhone, it will be considerably lower. 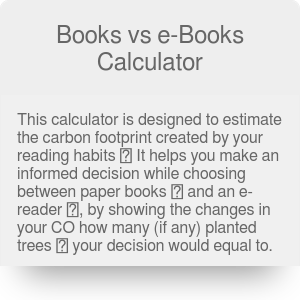 Once you provide this information to our books vs. ebooks calculator, it will automatically determine the CO₂ emission reduction. Additionally, it recalculates this value to something more tangible - a planted trees equivalent. Assuming one tree can absorb 48 pounds of CO₂ annually, this is the number of trees you would need to plant to compensate for your reading habits. Borrow books from a library. Instead of buying new books and encouraging the production of paper, you can read books available at your local library. Not only will you help save the environment, but also support a local business! Join a book club. A book club is a great place to exchange books with other people and share the ones you love the most. By borrowing books from your colleagues, you will lower your carbon footprint. Sell or donate unloved books. There's a special place in hell reserved for people who throw books into the trash. If you don't like a book anymore, don't throw it away. Instead, sell it or donate it to a local library. Recycle books. If a book you own is in an absolutely unreadable condition, or it's so boring that no one wants to accept it as a donation, make sure to recycle it in order to minimize the ecological footprint. Books vs e-Books Calculator can be embedded on your website to enrich the content you wrote and make it easier for your visitors to understand your message.